Triplemint Meringues | What Smells So Good? Preheat the oven to 250F and line a baking sheet with parchment. Whisk together the sugar, salt, potato starch and mint in a small bowl, set aside. In a metal or ceramic (not plastic) bowl, whip egg whites until soft peaks form. Slowly beat in the sugar mixture and whip until stiff, glossy peaks form. Add the food colouring (if using) and extract and beat until incorporated. By hand, fold in the mint chocolate chips. Dollop spoonfuls onto the parchment for “rustic” (i.e. 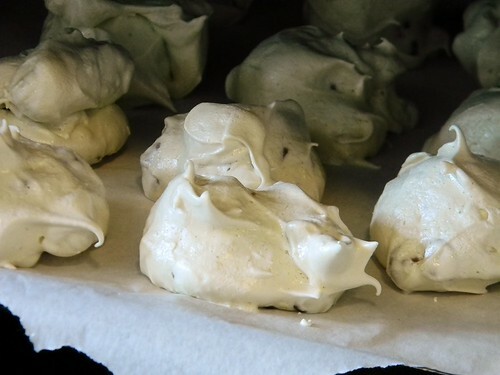 no-fuss) cookies, or transfer the meringue to a piping bag and pipe round blobs onto the sheet. Bake for 75 minutes on the lowest rack of the oven. Turn off the oven, leaving the cookies inside, and leave for 3-4 hours before removing.